Map of England and Wales used by American politician Samuel Atkins Eliot on his 1821 'Grand Tour' of Europe. Cary’s Reduction of his Large Map of England and Wales, with part of Scotland; Comprehending the whole of the Turnpike Roads, With the Great Rivers and the Course of the different Navigable Canals: also The Market and Borough Town, and principal places adjoining the Road. To which is added, the Actual distance from one Market Town to another, with The exact admeasurement prefixed to each from the Metropolis. Published by Order of, and Dedicated with Permission to The Right Honorable the Post Masters General, by their Lordships, much Obliged & Obedient Servant, John Cary. 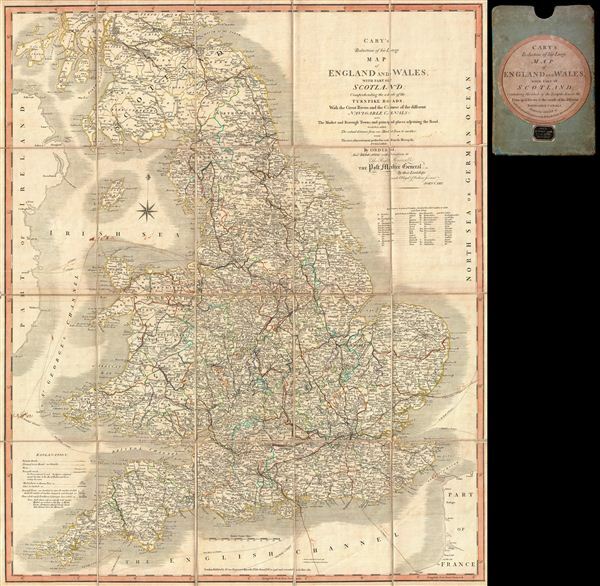 A fine example of John Cary's 1815 map of england and Wales. The map covers all of england and Wales as well as parts of Scotland. Cary identifies all towns and roads, noting mileage between most destinations. First issued in 1796, this map was one of the finest and most popular portable maps of the country available and consequently enjoyed considerably popularity and an over 50 year run. The present example was updated in 1815. Later editions, published after Cary's death, bear the Cruchley imprint. Unlike most antique maps, this map has an interesting and known provenance. It was used by the American politician Samuel Atkins eliot (1798 - 1862) on his 1821 european tour. At various points in his career, eliot, a Whig, served in the Massachusetts Senate, was the Mayor of Boston, and represented Massachusetts in the United States House of Representatives. eliot traveled to europe on the classic 'Grand Tour' in 1821. Sailing from Boston, he landed at the port of Liverpool, where he acquired this map at the shop of W. Robinson, Castle Street. He traveled throughout england and Scotland, where no doubt this map came in handy as his route is marked in pen, before embarking for the continent several months later. Very good. Original linen backing fragile and split in places. Some pen marks relating to Samuel A. Elliot's 1821 voyage. Comes with original cardboard slipcase with 'Sold by W. Robinson' stamp. National Library of Australia, MAP Ra 25 Plate 9 (v. 1).